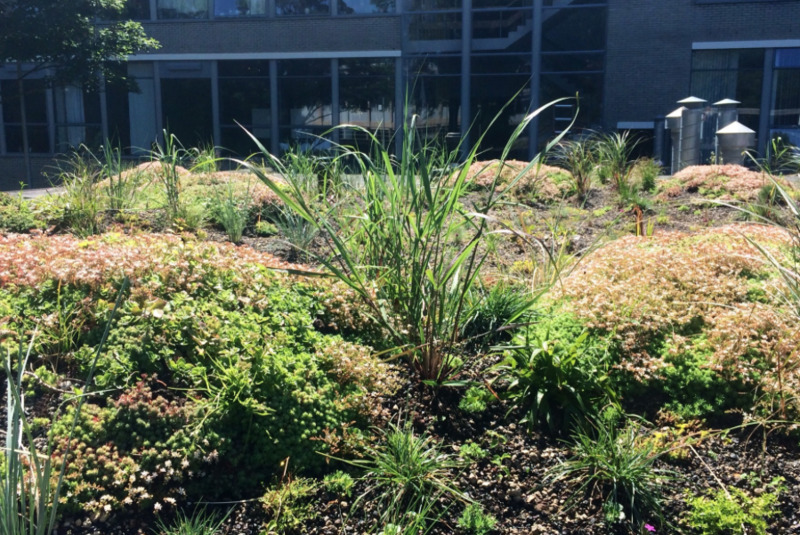 New green roof developments are making good progress to cater biodiversity in our cities. Claire Diebel, German Chancellor Fellow, notes this in her research. “In Germany the ratio of extensive green roofs to intensive green roofs has been 85 to 15, but now we’re seeing a trend in Europe for lush roof gardens, rather than thin, non- accessible green roofs. Local biodiversity has a profound effect on the survival of nature and the services it provides. To permit continued biodiversity loss means loosing the bonuses that come along with it; climatic services, flood buffering, air and water filtering, nutrient recycling, soil fertility, and natural resources such as wood and food. The vegetation created with green roofs is one method for urban biodiversity conservation. Green roofs are commonly inhabited by various insects, including bees, spiders, butterflies, and leaf-hoppers. The work of Swiss soil scientist, Stephan Brenneisen, observed that green roofs of thin substrate provide habitats for a number of drought tolerant invertebrates, while deeper substrates retain more moisture, and therefore provide habitats for species requiring a more diverse vegetation cover. 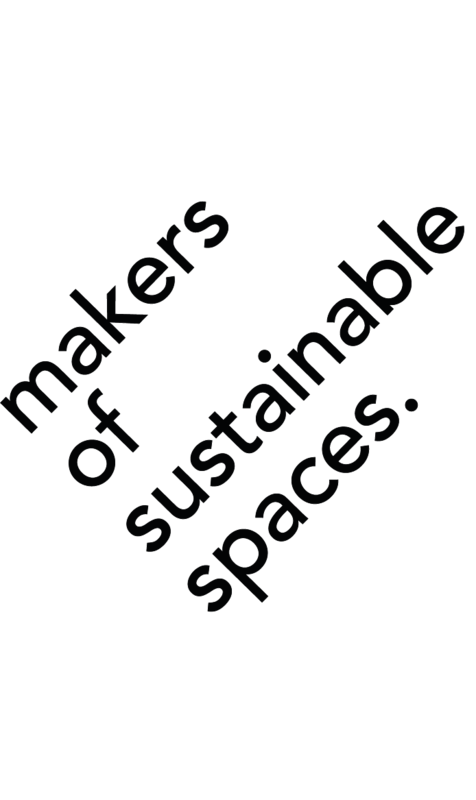 By varying the depth of green roofs, a series of micro-habitats are created, which increases the urban biodiversity habitat. Intensive green roofs generally measure 18cm or more in depth, while extensive green roofs measure between 5-15cm. On one hand, intensive green roofs provide more opportunities for micro-habitats than extensive green roofs do. They also offer enhanced ecosystem services such as augmented storm water retention and insulation properties. On the other hand, due to the deeper substrate, intensive green roofs are characterized by greater weight (200 – 1,500 kg/m. when saturated), higher capital costs, and consequently a higher maintenance demand. In response to the challenges that come along with intensive green roofs, Rooflife, a green roof architecture firm in Amsterdam, has developed the “Grassy Hill Roof”. The design has realized a lightweight undulating polystyrene form which delivers different media depths without the usual heavy weight load. 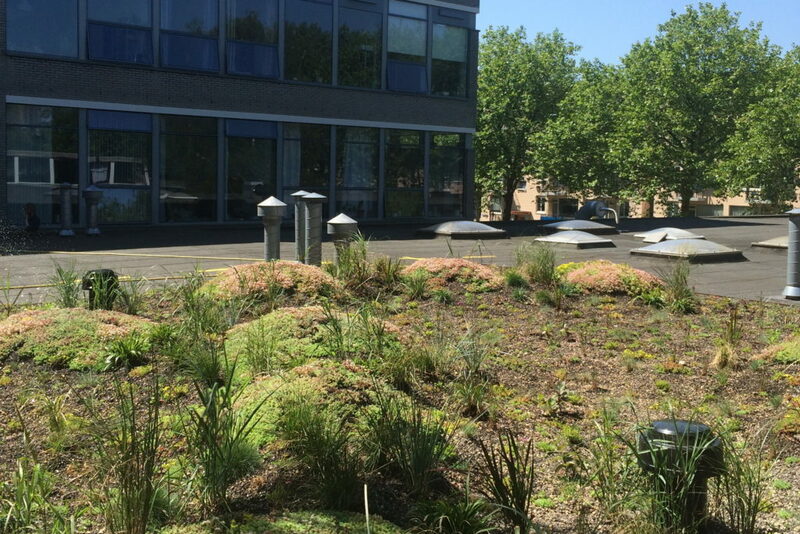 The Grassy Hill Roof was installed on the roof of WOW Amsterdam with herbs, grasses, flowering plants, and several sedum species. Since the roof was planted in May 2015, a growing population of insects and birds have nested in the Grassy Hill Roof. Vegetation on specially designed roofs can provide feeding and nesting structures for bird and insect species. 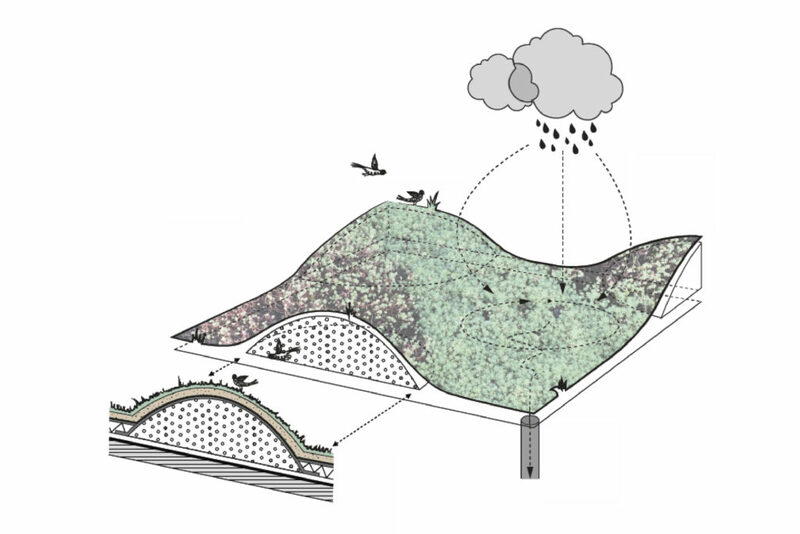 The most crucial aspects for supporting biodiversity include the use of a diverse array of both native and non-native plants, the use of “hilly” structures in contrast to shallow structures (Kohler, Ksiazek-Mikenas 2017), and the creation of both high and low moisture zones. Until recently, the design of green roofs was limited by structure and engineering considerations. Therefore, most green roofs have been designed as extensive systems with shallow substrates. Biodiverse roofs play an important role on the quality of life in urban environments. Clever solutions such as Rooflife’s Grassy Hill Roof make great progress in enhancing biodiversity without the added expenditures of traditional intensive green roofs. Claire Diebel earned her MA at Tongji University and is a green infrastructure designer and researcher. Currently, Claire is carrying out a yearlong research project about vegetative roofs and urban farms, sponsored by the Alexander von Humboldt Foundation.